I woke-up Saturday morning to my son asking my husband: “Did you get the tickets? Did ya? Did ya?” Good thing they were not in the room with me–I might have told him “no” (even though I did buy them last week). But it was 6am. SIX. A. M. That’s like a whole thirty minutes before I should be getting up to make breakfast for the baby. I NEED that thirty minutes. Although, it was totally a valid question. My husband’s response: “I don’t know, I’ll ask mom later.” Smart man. So, I decided to break the news to both of them over a special breakfast that morning: Star Wars™ Light Saber Cookie Treats. 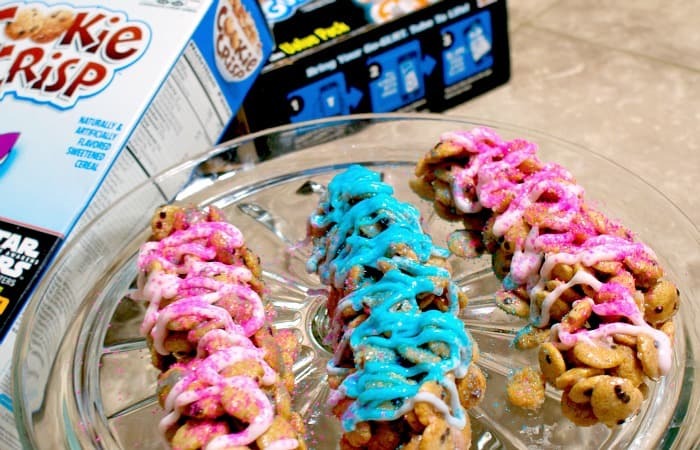 I mean, an awesome breakfast of Cookie Crisp® Cereal Treats with Go-Gurt® Topping. Really, the smiles when I put those light sabers on the table–and the grins when they heard I’d bought the 7:30pm tickets for Friday? Perfection. I’ve even already made babysitter plans for the girls. And my son gets out early on Friday–so he and I are going to stand in line while his dad finishes-up at work. Then he’s going to bring us dinner. We’ve got this all planned-out. 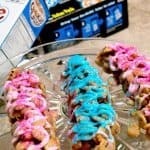 And I think I might be making these Light Saber Cookie Crisp Cereal Treats again for breakfast Saturday, or maybe one of these other treats…before we head to the theater for round 2. Heh. 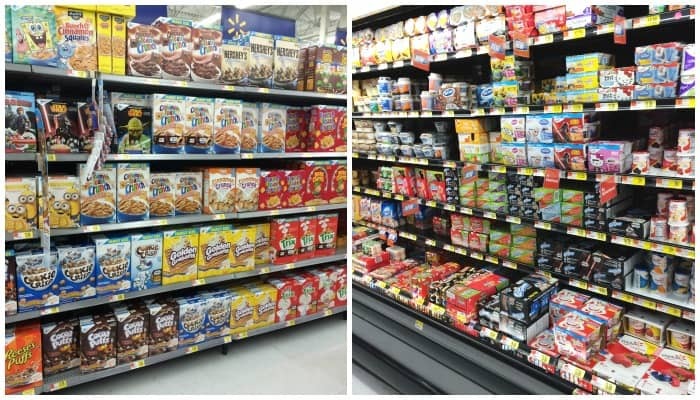 I totally came up with this quick idea the other day when my son and I hit Walmart together. He was SOOOOO excited to see that there were these special Star Wars™ cereal boxes for Cookie Crisp, Honey Nut Cheerios, and Cinnamon Toast Crunch (his favorites). 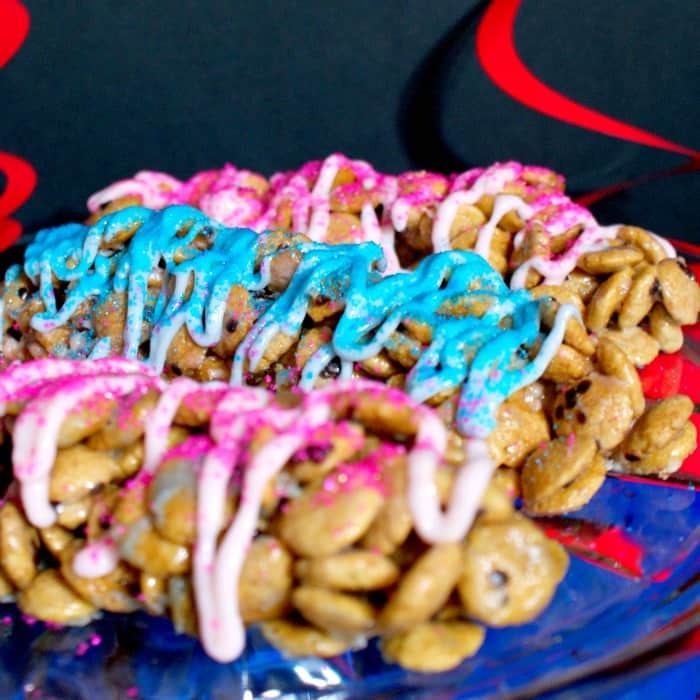 Yeah, the idea was pretty simple: combine MY favorite cereal (uh, yeah, I like to pretend I’m 12 when I eat cereal, so there) with some marshmallows, then top with a liberal squirting of my son’s favorite yogurt Go-Gurt. Match made on the dark side… What is that funny pretend quote from Darth Vader? 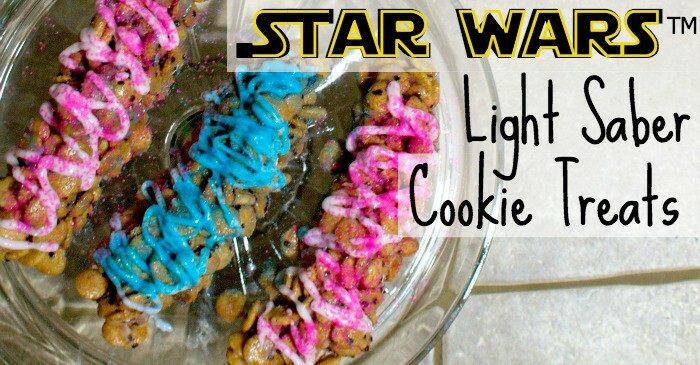 Oh yeah, “Come to the dark side…we have cookies.” I’m there with this recipe. What cracks me up is that Star Wars™ totally brings us together as a family–2 different generations of Star Wars™ lovers just so ecstatic about the same movie release. That doesn’t happen every day. 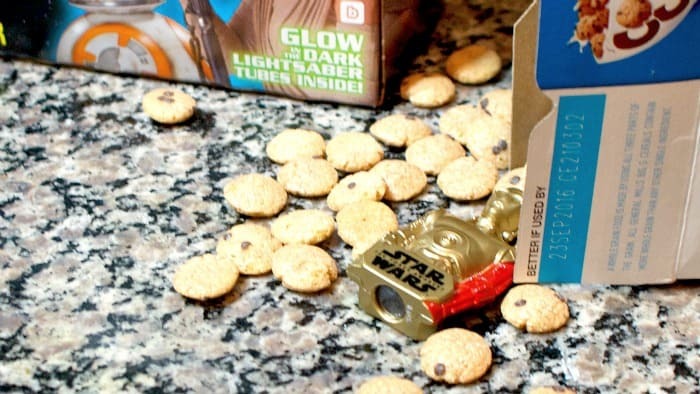 I mean, we totally come together over Cookie Crisp, too, but, let’s be honest, it does add a little awesome when the cereal has a Star Wars™ spin on it. Heh. 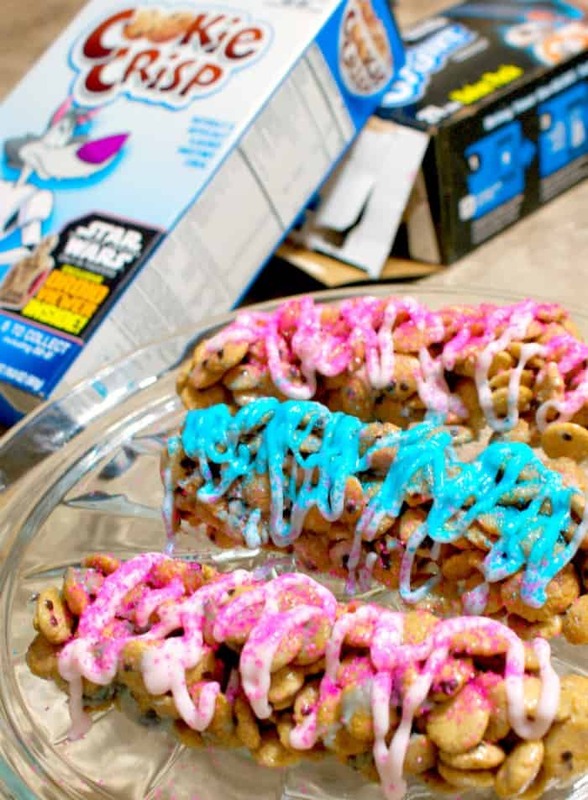 Star Wars™ Light Saber Cookie Crisp® Cereal Treats with Go-Gurt® Topping. I mean, really, the smiles when I put those light sabers on the table...priceless. In a dutch oven or large pot, place the butter over medium heat. When the butter has melted completely, add the marshmallows and stir continuously until all of the marshmallows have melted. Immediately remove from heat and add-in the Cookie Crisp. Stir until the Cookie Crisp is completely covered. Allow to cool until it can be handled and does not fall apart easily. While that's cooling, preheat the oven to 170-degrees and prepare a cookie sheet with parchment paper or foil. 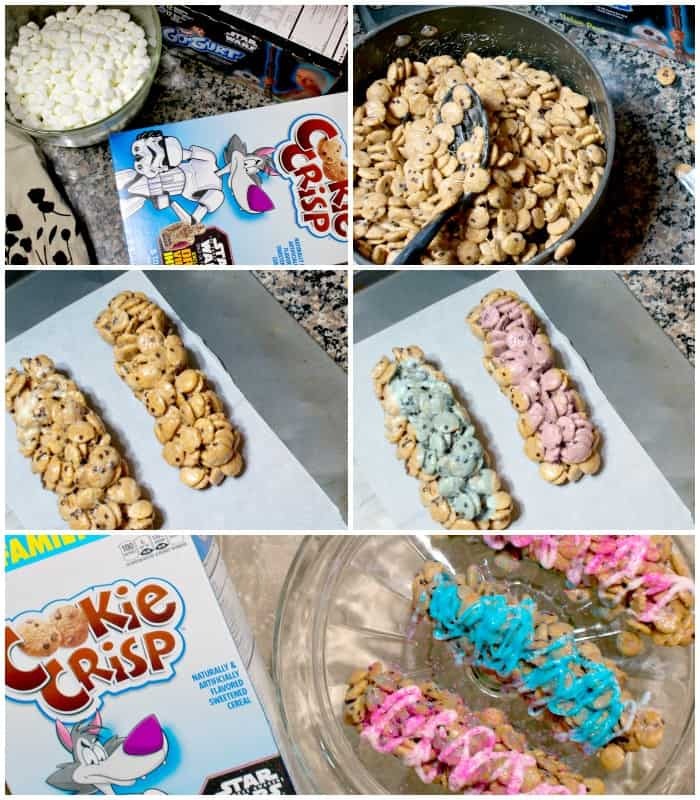 Form Cookie Crisp into long sticks (use about 1 cup of Cookie Crisp per stick). Generously pour a Go-Gurt pouch over each light saber. Place in the oven for 30-35 minutes. Remove from oven and allow to cool--if the kind of melted a little, you can easily reform them. Enjoy, but keep it away from the Wookies, because they'll eat ALL your cookies! What also brought us together Saturday: this toy you can only get in the special Star Wars™ boxes. We totally sat around the breakfast table bonding over C-3PO and his red-arm vs. gold-arm days. Reminiscing over the growth of a droid character…yeah, we’re a family of nerds. So? Does Star Wars™ bring your family together? I totally want to hear about it! Drop me a comment below and let me know how y’all bond over yummy snacks and Star Wars™ trivia. LOL!